Lost in all of the sports news this past few days was a tragic death in a high school football game in Alabama. Yes, we have all heard and read about the alleged disgraceful behavior of University of Michigan Football Coach Brady Hoke leaving his injured quarterback in a game that was far out of reach, failing to pull him and have him evaluated for a possible concussion, and putting him back on the field before he could be evaluated. We also have now heard in headline stories that the brain of former Kansas City Chiefs linebacker Jovan Belcher shows signs of CTE. But did you hear about the death of 17-year old Charles Henderson High School (Troy, AL) cornerback Demario Harris, who collapsed on the field as the result of a traumatic brain injury (TBI) and did not survive the weekend? Unless you lived in the football-crazy state of Alabama, you probably did not. And that in itself is a travesty. 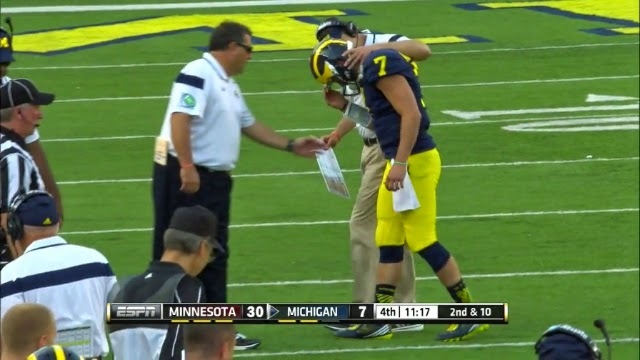 It should be in the national news, as is the saga of Brady Hoke and his quarterback Shane Morris. It may be by the Grace of God that Morris did not suffer the fate of the young cornerback from Alabama, but they are linked by a common thread that goes beyond football, yet also is a fact of football that cannot be swept under the carpet as the National Football League has done for so many years. Traumatic Brain Injuries are unavoidable in football and we as fans really need to understand this and stop tolerating coaches, leagues, and programs that try to diminish this reality. We need to put aside our need for the entertainment of watching 300 lb linemen try to out-hit and out-pulverize each other and think about what it is we are really doing by giving colleges and the NFL our undying love. a traumatic brain injury suffered during a game on Friday, September 26, 2014. Yet, the story about the death of Demario Harris is nowhere to be found on the ESPN web site or on CNN. Perhaps it did not make the news wire or if it did it was decided that it was not big enough news. But the sad reality is that it is an essential part of the brain injury stories of Moore, Belcher, and every other player who has taken repeated blows to the head in the game. The death of Harris, which happened the night before Moore even took the field in Ann Arbor is the punctuation point in the context of football this weekend. So what we are left with in Troy, Alabama is profound grief and sadness over the tragic loss of a beloved teammate and classmate, made worse with one newspaper reporting his death the day before he was actually declared dead (and they then pulled the story). There is a quote from his coach that the doctor told him that the young man suffered an aneurysm that “had nothing to do with football” and that it just happened to occur on the football field. But the boy’s father said that contrary to reports, it was not an aneurysm but a hemorrhage that resulted from a hit he took during the game. We might never know the truth of exactly what happened, but we know the boy died playing football. “Someone got even with Logan Thomas on that one!” whoops Gary Danielson, the color commentator. This is a reference to an earlier play in which Thomas, running in the open field, leveled a defender. By the code of the game, the shame Thomas visited upon the defense warranted this revenge…One hears in Danielson’s jargon the expected deployment of euphemism, and in his tone the kind of earnest exculpatory vigor so common among football analysts. He’s trying to reassure himself, as well as us fans, that the traumatic brain injury Logan just sustained (and sustains over and over in the replays) is, within the ethical borders of the game, permissible. And it was just not Cunningham and his on-air partner Mike Patrick. It was the fans in the stadium and the fans watching on TV, all now screaming that Hoke be fired immediately for what is seen as this shocking disregard for player safety. There are those who say this is only because Michigan is 2-3 and it would not be happening if they were 5-0. Maybe, but no one can say for sure because they are not 5-0. But Lord knows we cannot live without our football. Michigan will play again this weekend. Kansas City will play again this weekend. 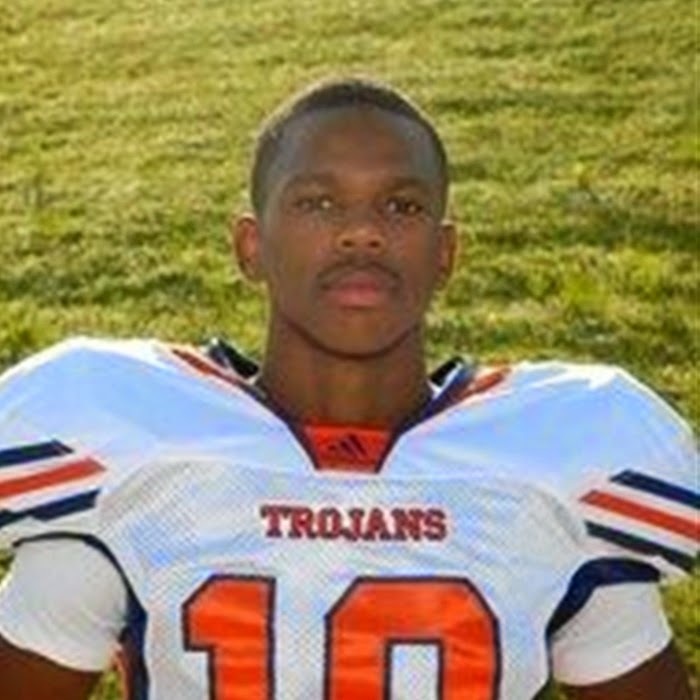 Charles Henderson High School will play again this weekend, albeit with a heavy heart. As fans, we will dutifully watch and cheer on our teams to a hoped for victory. We will grimace when we see a player get hurt and applaud him has he is take off the field. We will then resume our adoration and cheering for the action on the field. But at what cost to the players involved? In the span of one to two weeks in one location, I met a nuclear engineer, a 15 year old high school sophomore, a 19 year old college student, a heavy equipment operator, a personal trainer, a prison guard, and a preacher. Yes they were a disparate group, but believe it or not they shared one very tragic important trait with Formula 1 racing legend Michael Schumacher. They all had suffered a traumatic brain injury. Unlike Schumacher, they were not rich or famous so they did not have a worldwide platform with a built in audience of millions to tell their stories. And unlike Schumacher's family and handlers, they wanted to share their stories to give people hope and raise awareness about the devastation that comes with a TBI. You see, when Schumacher was transferred to a rehabilitation facility today, his manager, Sabine Kehm, stated that his continued recovery would take place in private and that they would sue any reporters who wrote anything more about it. This was because of all the conjecture and speculation that has been reported in all forms of media since his skiing accident last December. Unfortunately, his manager and family have missed two golden opportunities that would have helped not only themselves, but the millions of people around the world that have suffered and survived a TBI. The first opportunity is simple: manage the story. Because they have held any and all information so tightly since his accident, and plan to do so going forward, they are giving up all control of the narrative. This means that with Schumacher's millions of fans, there was a vacuum to be filled. Nature abhors a vacuum, so the space was filled with conjecture, speculation, and information that was flat out wrong because everyday people do not know squat about TBIs. In fact, they probably have no idea that in the United States, more people die every year as a result of a TBI than they do of Breast Cancer. If the Schumacher family takes control of the narrative, they can provide information as they see fit, along with explanations of what is specifically means for him. This is important because no two brain injuries are alike, and there is no standard prognosis or predicted outcome for them. I know what I am saying because my now 19-year old daughter was hit by an SUV when she was running on January 13, 2013. From the very beginning, we were like the Schumachers as we did not release any information to the news media until we were ready. And when we released it, we knew what we wanted the narrative to be about. We were also in a period of great uncertainty as my daughter lay in a coma, not knowing if she was going to live or die, or what would happen with her life. We debated how much information to share publicly, but we were also overwhelmed repeating the same story and information over and over again. After a few days, we set up a Facebook page to share the story of her journey of recovery, as well as to help people understand the challenges of a TBI. This is the second opportunity the Schumacher's have: to help raise awareness of TBIs through Michael's story. When people read the news today, they read that Michael was out of his coma and released from the hospital. People were quick to scream "hurray" because they had no idea what is ahead for him and his family. This is a message that needs to be shared loud and far. No other person today, perhaps with the exception of former Congresswoman Gabbie Giffords or ABC New Correspondent Bob Woodruff, has the visibility of Schumacher, especially in the world of sport. This is important because the people most susceptible to brain injuries are young and experience these injuries while physically athletic. What better way is there for a global audience to learn the challenges faced by TBI survivors and their families? What better way is there to reach these people to help them avoid a preventable injury? Granted, the Schumacher family is entitled to their privacy and I am not arguing that here. The media and Michael's "fans" who believe they are entitled to know everything are entitled to nothing. It his the Schumacher's story to share or not. What I am asking the Schumacher family and Sabine Kehm to consider is what a gift it would be, for so many voices who cannot be and are not heard, to share their story and the long journey they are now undertaking. They will be surprised at how valuable that would be for so many, many people. So what about the people I mentioned at the beginning of this piece? The causes of their accidents were as different as the people themselves. The nuclear engineer and prison guard were injured in automobile accidents. The 15 year old high school student was injured when he was playing with his father's handgun. The 19 year old college student was shot, execution style, in a home invasion robbery. The heavy equipment operator was crushed and had his oxygen flow cut off when the hydraulics on his equipment failed. The personal trainer and the preacher had strokes, with the trainer's stroke possibly caused by a visit to a beauty salon. They were all different people with different stories, but they shared a bond no one ever wants to share: they suffered an injury that forever changed the lives of them and their families, an injury that is more common than you know. Traumatic brain injury (TBI) is a major cause of death and disability in the United States, contributing to about 30% of all injury deaths. Every day, 138 people in the United States die from injuries that include TBI. Those who survive a TBI can face effects lasting a few days to disabilities which may last the rest of their lives. Effects of TBI can include impaired thinking or memory, movement, sensation (e.g., vision or hearing), or emotional functioning (e.g., personality changes, depression). These issues not only affect individuals but can have lasting effects on families and communities. •In 2010, about 2.5 million emergency department (ED) visits, hospitalizations, or deaths were associated with TBI—either alone or in combination with other injuries—in the United States. ◦TBI contributed to the deaths of more than 50,000 people. ◦TBI was a diagnosis in more than 280,000 hospitalizations and 2.2 million ED visits. These consisted of TBI alone or TBI in combination with other injuries. •Over the past decade (2001–2010), while rates of TBI-related ED visits increased by 70%, hospitalization rates only increased by 11% and death rates decreased by 7%. •In 2009, an estimated 248,418 children (age 20 or younger) were treated in U.S. EDs for sports and recreation-related injuries that included a diagnosis of concussion or TBI. ◦From 2001 to 2009, the rate of ED visits for sports and recreation-related injuries with a diagnosis of concussion or TBI, alone or in combination with other injuries, rose 57% among children (age 20 or younger). Sports Illustrated has launched a fan poll called "Best and Worst in Sports Media." You can make your picks for the six questions by Wednesday at 9 a.m. ET, and check back later on Wednesday when Richard Deitsch reveals the winners in his column. By the time I arrived in Athens, Georgia in 1994, Larry Munson was already 72 years old and well-ensconced as the "Voice of the Georgia Bulldogs." Almost everyone I knew in Athens loved him. I did not. I could not understand how they could like this play-by-play announcer who was a clear "homer". How could they love this true curmudgeon? How could they love a man who at times could not even tell listeners what players were in on a play. But something funny happened over the next few years. Munson grew on me. Jimmer Fredette has been named the 2011 Naismith Men's College Player of the Year, becoming the third Mountain West Conference (MWC) player to win the award. Here is the full press release from the Atlanta Tipoff Club. There are concerns out and about that the fact that there are no number one or two seeds left in the upcoming Final Four could lead to lower ratings on CBS. The Time-Warner networks (TNT, TBS, and TruTV) are out of the picture, so the public relations folks cannot play the Nielsen numbers game to show record ratings. The 2011 Sports Emmy Nominations are out, and the 2010 National Spelling Bee is nominated. Really. No kidding. Verne Lundquist is also nominated for outstanding play-by-play, and there is a new category for "Outstanding Playoff Coverage." The winners will be announced on Monday, May 2, 2011. I got home from work in time to catch the end of the "AT&T At the Half" on TruTV and then the second half of the scintillating battle between UNC-Asheville and Arkansas-Little Rock. As to be expected there are pluses and minuses, and Charles Barkley has been refreshingly good. So with that being said, here are some thoughts and observations. As tonight's BCS National Championship game approaches, ESPN Play-By-Play man Brent Musburger has been elected to the National Sportscasters and Sportswriters Association Hall of Fame, joining Bob Uecker and Bob Ryan, according to NSSA Executive Director Dave Goren. They're joined in the winners' circle by 2010 National Sportscaster of the Year Mike Tirico of ABC and ESPN and by 2010 National Sportswriter of the Year Peter King of Sports Illustrated and si.com. 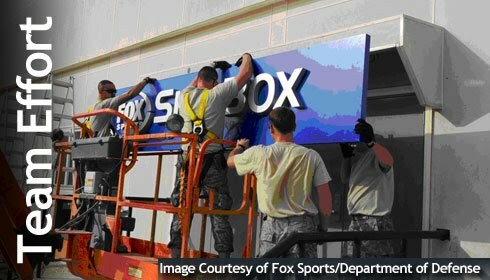 They will be honored, along with 110 State Sportscasters and Sportswriters of the Year during the NSSA's 52nd Annual Awards Weekend, May 14-16, 2011, in Salisbury, NC. The National Hockey League (NHL) has come to their senses and realized that you cannot safely play a hockey game when it is 50 degrees out and raining. So the NHL and NBC Sports have announced that the Bridgestone NHL Winter Classic start time will be pushed back to 8:00 PM ET on Saturday, January 1, 2011.